I did something really, really stupid on Wednesday afternoon. I fell over. Well, I didn’t just fall over. I shattered all the bones in my lower right arm. My cat was looking a little poorly so I went to the back door to let her out, turned in the porch, tripped over the massive step on the new door that I’ve had fitted and fell into the front room. (Skip the next two lines if you’re squeamish!). I lay on the floor looking at my arm and it was twisted out at a really weird angle. It was ‘bendy’ to say the least and I was bleeding all over the carpet where the bone had come through (sorry, I did warn you!!). Open fracture. I was lying on the floor for an hour before the ambulance arrived. They took me to hospital and pumped me full of morphine and gas and air (woohoo!). 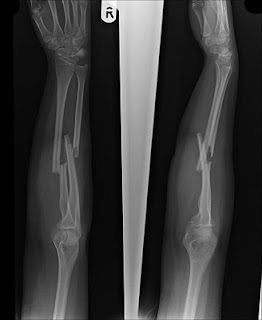 The x-ray showed that I had shattered both bones completely and a hand specialist was needed, so I had a four hour operation on Thursday morning to insert two large steel plates into my arm to hold it together. I’m now home with my arm in a massive sling and I have to keep it elevated as much as possible. Three fingers work fine but two are numb, so I have physio work to do with them. The stitches and bandages come off 3rd Sept.
EDIT: For all you pain ghouls/medics out there, there is the extent of the injury. Pretty cool, huh? 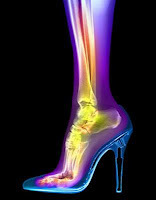 when do we get to see your gnarly xray?